Elizabeth Healey was the wife of Joseph Healey, an apothecary from Harpurhey. Joseph Healey, who had been born in Bent in 1780, was influenced by the ideas of Major John Cartwright and had formed a Hampden Club in Oldham in 1816. A quack doctor who was virtually illiterate, Joseph Healey was one of the main leaders of the parliamentary reform movement in Lancashire. Joseph Healey had a reputation for being a militant reformer and his Oldham banner at the St. Peter's Field demonstration was black with a white painted inscription: 'Equal Representation or Death'. After the Peterloo Massacre Healey was arrested along with Henry Hunt, Joseph Johnson, Samuel Bamford and John Knight and charged with "assembling with unlawful banners for the purpose of moving and inciting subjects of the king to contempt and hatred of the government". During the court case in March 1820, a great deal was made of Healey's 'Equal Representation or Death' banner. Joseph Healey was found guilty and sentenced to one year in Lincoln Prison. Joseph Healey had expected trouble at St. Peter's Field and suggested his wife should stay at home. Elizabeth Healey, a committed supporter of parliamentary reform, rejected the advice. At the meeting Elizabeth became ill and took refuge at a house in Windmill Street from where she observed the Manchester and Salford Yeomanry Cavalry attack the crowd. Afterwards, Elizabeth Healey was interviewed about her experiences by Samuel Bamford. 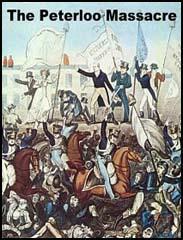 (1) Elizabeth Healey was interviewed by Samuel Bamford a few days after the Peterloo Massacre. 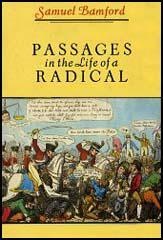 Her account appeared in Bamford's book Passage in the Life of a Radical in 1843. I was determined to go to the meeting, and would have gone even if my husband had refused his consent. After much persuasion he consented. I left my daughter with a careful neighbour woman, and joined some other married females at the head of the procession. I was dressed plainly as a countrywoman, in my second best attire. My companions were also neatly dressed as the wives of working men. I had seen Mr. Hunt before that time; they had not, and some of them were quite eager to obtain good places, that they might see and hear one of whom so much had been reported. In going down Mosley Street I lost sight of my husband. Mrs. Yates, who had hold of my arm, would keep hurrying forward to get a good place, and when the crowd opened for the Middleton procession, Mrs. Yates and myself, and some other women, went close to the hustings, quite glad that we had obtained such a situation for seeing and hearing all. My husband got on the stage, but when afterwards I saw him leap down and lost sight of him, I began to be unhappy. The crowd seemed to have increased very much, for we became insufferably pressed. We were surrounded by men who were strangers, we were almost suffocated, and to me the heat was quite sickening. Every moment I became worse, and I told some men that I was sick, and begged they would let me pass. They immediately made a way, many of them saying, "make way, she's sick, let her go out," I passed out of the crowd, and turning to my right, I got on some high ground, on which stood a row of houses - this was Windmill Street. I thought if I could get to stand at the door of one of those houses I should have a good view of the meeting. I saw a door open, and I stepped in, the people of the house making no objections. By this time Mr. Hunt was on the hustings addressing the people. In a minute or two some soldiers came riding up. The good folks of the house, and some who seemed to be visitors, said "the soldiers were only to keep order, they would not meddle with the people;" but I was alarmed. The people shouted, and then the soldiers shouted, waving their swords. Then they rode amongst the people, and there was a great outcry, and a moment after a man passed without a hat, and wiping the blood off his head with his hand, and it ran down his arm in a great stream. The meeting was all in tumult; there were dreadful cries; the soldiers kept riding amongst the people and striking with their swords. The front door opened, and a number of men entered, carrying the body of a decent, middle-aged woman, who had been killed.